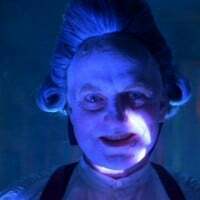 The leader of the Cenobites after World War I. Angelique summoned him to the basement of Merchant’s office building after having Sharpe solve the Box. He created the Twin Cenobites out of the twin security guards that discovered him. He sent them back to Hell to be finished. He disagreed with Angelique on how to get Merchant to finish the Elysium Configuration. He wanted to threaten him into it. Originally, she was a homeless girl who had no family and wasn’t “even christened.” Jacques brought her to de L’Isle to use in his black magic ceremony. She was fed rotten food and then tied to a chair. Jacques strangled her to death and she was skinned. Her blood was poured into a pentangle under the dining room table, and her skin was suspended over this with hooks and chains. De L’Isle performed his black magic ceremony, using the Lament Configuration, and summoned a demon from Hell to inhabit Angelique’s skin. De L’Isle showed her, her reflection and named her “Angelique.” As a Cenobite, her skull is split down the middle and the skin is pulled toward her shoulders with wires. She wears a black bodice which is sewn into her chest. Former Security Guards. 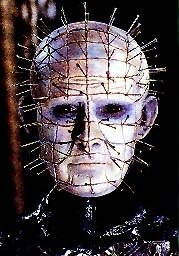 Pinhead summoned a Cenobite Maker from Hell, and the twin’s flesh was twisted together. Pinhead sent them back to Hell to be finished. 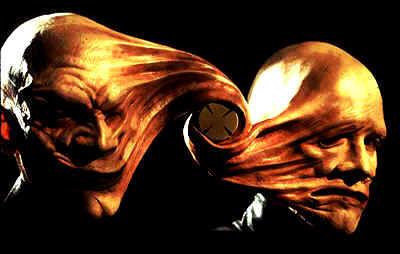 As Cenobite, the Twins are one person from the neck down. Their faces are twisted together on the sides. The left twin’s face is permanently grinning, while the right twin’s face is forever frowning. In the center of their twisted flesh is the disk from the star panel of the Lament Configuration. 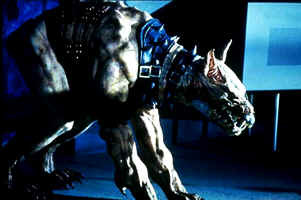 Pinhead’s pet: a Cenobite dog. Wires pll back the skin around its mouth, exposing large and sharp teeth. It constantly drools and clicks its teeth together.